Summary of today’s show: Cardinal Timothy Dolan set the tone for the semi-annual US Bishops Conference meeting in Baltimore this week in his president’s address when he exhorted his brother bishops to greater personal conversion and reconciliation and maintained that the New Evangelization is dead in the water without personal conversion and a striving for holiness by all the people, led by our bishops. Scot Landry and Fr. Chris O’Connor take Cardinal Dolan’s speech in-depth and discuss its implications, which include the newsworthy suggestion of the renewal of Friday abstinence throughout the year. 1st segment: Scot welcomed listeners to the show and thanked veterans for their service on the day after Veterans Day was observed. Fr. Chris O’Connor related his day yesterday, taking advantage of the beautiful weather. He said he will be at St. Julia in Weston tomorrow at 7pm talking about our faith and what it is we believe, based on the first part of the Catechism. Throughout the rest of the Year of Faith, there will be talks on the three other parts of the Catechism. They also discussed St. Julia’s and the beautiful renovations they’ve done there. Scot said every November all the bishops of the US gather to vote and discuss current issues in the Church and administrative issues. This general assembly has been moderately newsworthy. Earlier today the bishop unanimously agreed to advance the cause of canonization for Dorothy Day. Fr. Chris said she epitomizes the struggle for holiness and the difficulties. She opened soup kitchens throughout the United States and pioneered the social justice movement. He said she showed how the poor that we care for may not be pleasant to our eyes, ears, or nose, but still are Christ among us. The bishops also approved a document on better preaching in our Sunday homilies and a new special collection for the Archdiocese of the Military Services. Scot said many of our servicemen and women can go months without seeing a Catholic chaplain and these mainly young people need to be able to receive the sacraments more often as they are separated from everything they know and love and are often confronted with the great questions of life. Scot said Cardinal Seán briefed his brother bishops yesterday on the defeat of Question 2 and assisted suicide in Massachusetts. The bishops were moved by the fact that despite very long odds, we are able to turn back assisted suicide. 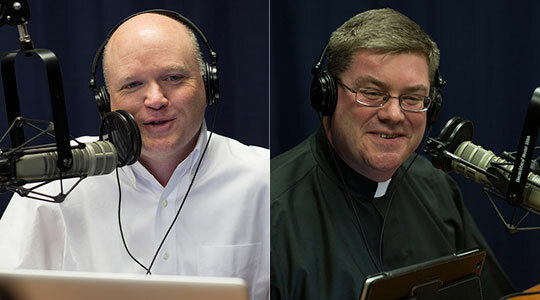 On Sunday about 45 bishops and about 50 or so Catholic bloggers talked about how new media and social media have changed how people receive information about the Church. One of the leaders of the event was Bishop Christopher Coyne, who is originally from the archdiocese. Many of the bishops had questions for the bloggers on how to start and what they as bishops should be doing themselves. How can they use Twitter and stay within the propriety of the office of bishop. Fr. Chris said this is part of a larger conversation where our society recognizes that people aren’t watching TV or reading newspapers, but are getting information through new media. The message is the same—Jesus is Lord—but the way we spread it changes. Yes, we have “a lot on our plate” as we commence our meeting, urgent issues very worthy of our solicitude as pastors — the suffering in vast areas not far from here caused by the Hurricane of two weeks ago, the imperative to the New Evangelization, the invitation offered by the Year of Faith, and our continued dialogue, engagement, and prophetic challenge to our culture over urgent issues such as the protection of human life, the defense of marriage, the promotion of human dignity in the lives of the poor, the immigrant, those in danger from war and persecution throughout the world, and our continued efforts to defend our first and most cherished freedom — all issues calling for our renewed and enthusiastic commitment. We cannot engage culture unless we let Him first engage us; we cannot dialogue with others unless we first dialogue with Him; we cannot challenge unless we first let Him challenge us. Scot said that last line is one of the most quoted from this speech so far. Scot said this suggests that the first step of our ongoing conversion of the New Evangelization is to go deeper in our own relationship with Jesus Christ. Even the bishops. Fr. Chris said what’s most convincing is not what people say, but how they live their lives. We want to see lives rooted in Jesus Christ and given over to Him. Scot said as the entire Catholic Church in the United States we need to seek first the kingdom of God and we’re all called to be holy in our relationship with Jesus Christ. Fr. Chris said we are all on a journey as a Church moving toward the Lord. We’re all called to sanctity. Fifty years ago, on October 11, 1962, Blessed John XXIII courageously convened the Second Vatican Council “the greatest concern of which,” he insisted, “is that the sacred deposit of Christian doctrine should be guarded and taught more efficaciously.” (Allocution on the occasion of the opening of the Second Vatican Council, Gaudet mater ecclesia). We gather for our plenary assembly in our nation’s premiere see, at the close of the XIII Ordinary General Synod of Bishops, still near the beginning of the Year of Faith. Both occasions have the same origin, the same goal expressed by Blessed John XXIII: the effective transmission of the faith for the transformation of the world. A year ago we began our visits ad limina Petri et Pauli. I know you join me in expressing deep gratitude for the extraordinary affection, warmth and fraternal care with which our Holy Father welcomed us. But Pope Benedict did not stop with his gracious hospitality. No. He also gave us plenty of fatherly advice — for our ministry as pastors of the Church and our personal role in the New Evangelization. Scot said he was surprised by the emphasis to his brother bishops that the bishops are the first to need to re-evangelization. Fr. Chris said he’s making it clear that holiness is contagious but must start with the bishops. on the Fulton Sheen reference, Christ wants you to come to recognize the Lord and live like Him and then go and bring Christ to others. Scot said we can’t be sent until we know Jesus Christ. Fr. Chris said Cardinal Dolan is reminding the bishops that people need to know the faith and the bishops are the premier teachers of the faith. I would suggest this morning that this reservoir of our lives and ministry, when it comes especially to the New Evangelization, must first be filled with the spirit of interior conversion born of our own renewal. That’s the way we become channels of a truly effective transformation of the world, through our own witness of a penitential heart, and our own full embrace of the Sacrament of Penance. Scot said Cardinal Dolan was one of the six principal drafters of the final document of the synod. He says right up front that “we do not hesitate to recognize our personal sins.” The bishops are calling on each other to recognize their own sins and Scot called on all listeners to recognize in humility our weakness and sin to be better prepared for the New Evangelization. Fr. Chris said every saint has a past and every sinner a future. Our sins do not define us. What defines us is the call to holiness. The synod was about the transmission of the faith for the transformation of the world. Dolan said the way we do that is through our own witness of a penitential heart and our own full embrace of the sacrament of penance. Fr. Chris said confession should be a regular part of our Christian life to reconcile us and tell us we are not defined by our sins. To be sure, the sacraments of initiation – – Baptism, Confirmation, the Eucharist – – charge, challenge, and equip the agents of evangelization. Without those sacraments, we remain isolated, unredeemed, timid and unfed. But, the Sacrament of Reconciliation evangelizes the evangelizers, as it brings us sacramentally into contact with Jesus, who calls us to conversion of heart, and allows us to answer his invitation to repentance — a repentance from within that can then transform the world without. What an irony that despite the call of the Second Vatican Council for a renewal of the Sacrament of Penance, what we got instead was its near disappearance. We became very good in the years following the Council in calling for the reform of structures, systems, institutions, and people other than ourselves.That, too, is important; it can transform our society and world. But did we fail along the way to realize that in no way can the New Evangelization be reduced to a program, a process, or a call to structural reform; that it is first and foremost a deeply personal conversion within? “The Kingdom of God is within,” as Jesus taught. Vatican II called for a renewal of the sacrament of penance and what we got is a near disappearance. Fr. Chris said it’s one of the most profound sacraments. Scot said after the Council we took our eye off the ball, losing sight of what’s really important. We failed to recognize that the New Evangelization is a deeply person conversion within. Fr. Chris recalled instances in Scripture when we hear God say, I am. It is to the great I am that we return for forgiveness of our sins. I am! Admitting that leads to conversion of heart and repentance, the marrow of the Gospel-invitation. I remember the insightful words of a holy priest well known to many of us from his long apostolate to priests and seminarians in Rome, Monsignor Charles Elmer, wondering aloud from time to time if, following the close of the Council, we had sadly become a Church that forgot how to kneel. If we want the New Evangelization to work, it starts on our knees. We kneel in the Sacrament of Penance because we are profoundly sorry for our faults and our sins, serious obstacles to the New Evangelization. But then we stand forgiven, resolute to return to the work entrusted to us – as evangelizers of the Gospel of Mercy. Scot said if we want the New Evangelization to work, it starts on our knees in utter humility before our God. Fr. Chris said Cardinal Sean when he came to Boston spoke of the life of St. Francis and how his ministry took off when he heard from his knees Christ call him to rebuild His Church. Scot said people tell him they love Cardinal Sean because he’s so humble and prayerful. Scot said the Church is at her worst when she’s arrogant and not acting out of love. The Church on her knees is at her best because she’s in prayer and most connected with Christ in humility and open to being his vessel to the world. Fr. Chris said we kneel when we approach royalty. How much more should we kneel before our Lord. He said a priest told him that whenever he enters the church he kneels and prays an act of contrition. I recall a conversation about a year ago with one of our brother bishops, newly ordained, attending his first plenary assembly. I asked his impressions of the meeting. “Well organized, informative, enjoyable,” he replied, but he went on to observe that it was one moment in particular that had the greatest impact on him. It was during our closing Holy Hour, as he entered the large room next to the chapel, to see dozens and dozens of bishops lined up to approach the Sacrament of Penance. This new Bishop told me that he felt that moment had more of an influence upon him than anything else at the meeting. Who can forget the prophetic words of repentance from Blessed John Paul II, during the Great Jubilee, as he expressed contrition – publicly and repeatedly – for the sins of the past? He mentioned the shame of the slave trade, the horrors of the holocaust, the death and destruction wrought by the crusades, the injustices of the conquest of the new world, and the violence of religious wars, to name only a few. And so it turns to us, my brothers. How will we make the Year of Faith a time to renew the Sacrament of Penance, in our own loves and in the lives of our beloved people whom we serve? Once again, we will later this week approach the Sacrament of Penance. And we’ll have the opportunity during this meeting to approve a simple pastoral invitation to all our faithful to join us in renewing our appreciation for and use of the Sacrament. We will “Keep the Light On” during the upcoming Advent Season! The work of our Conference during the coming year includes reflections on re-embracing Friday as a particular day of penance, including the possible re-institution of abstinence on all Fridays of the year, not just during Lent. Our pastoral plan offers numerous resources for catechesis on the Sacrament of Penance, and the manifold graces that come to us from the frequent use of confession. Next June we will gather in a special assembly as brother bishops to pray and reflect on the mission entrusted to us by the Church, including our witness to personal conversion in Jesus Christ, and so to the New Evangelization. We work at giving our people good examples of humble, repentant pastors, aware of our own personal and corporate sins, constantly responding to the call of Jesus to interior conversion. Remember the Curé of Ars? When a concerned group of his worried supporters came to him with a stinging protest letter from a number of parishioners, demanding the bishop to remove John Vianney as their curé, claiming he was a sinner, ignorant, and awkward, St. John Vianney took the letter, read it carefully … and signed the petition! Scot noted that Dolan mentioned dioceses would embrace a program like The Light Is On For You in the Archdiocese of Boston. Fr. Chris said we can’t say to folks that confession is important and only offer it during 15 minutes on Saturday. That’s why he’s so grateful for places like St. Anthony Shrine in Boston for frequent confession. How great would it be to say that in every parish in the United States a priest is available on every Tuesday at the same time. One of the more newsworthy items has been the idea of re-instituting Friday abstinence every week of the year, not just Lent. When we lost this tradition, we lost a weekly reminder of our need for repentance. Fr. Chris said it also serves to make us one body, making a regular communal act of penance together. As I began my talk this morning, my brothers, so I would like to end it, with Blessed John XXIII. It was the Sunday angelus of October 28, 1962.The message the Holy Father delivered on that bright Roman afternoon never even mentions the phrase New Evangelization.But it strikes right at the heart of the mission entrusted to each of us as shepherds. How could we not see it alive in those holy men and women of every time and place, the heroic evangelizers of our faith, including most recently St. Kateri Tekakwitha and St. Marianne Cope? We have beheld it in the Church’s unrelenting corporal and spiritual works of mercy, in the heroic witness of persecuted Christians, in the Church’s defense of unborn human life, the care of our elders and the terminally ill, advocacy for the unemployed, those in poverty, our immigrant brothers and sisters, victims of terror and violence throughout our world, of all faiths and creeds, and in our defense of religious freedom, marriage and family. And, I have suggested today, that as we “come and go” in response to the invitation of Jesus, we begin with the Sacrament of Penance.This is the sacrament of the New Evangelization, for as Pope Benedict reminds us, “We cannot speak about the new evangelization without a sincere desire to conversion.” (Homily for the Opening of the XIII Ordinary General Synod of Bishops). Scot said it was classic Dolan. Despite the expected criticism, he knows the bishops and all Catholics need to hear it and to focus first on the spiritual, not temporal problems in the Church. Fr. Chris said people thronged to see Pope John Paul or Mother Teresa because people wanted to see and be near holiness. If we want to be evangelizers, then we need to seek holiness in ourselves first. Scot said he’s not surprised that so many of the bishops recognize the need for confession but that they would make the time in their meetings to prioritize this communal act of repentance. Just like at men’s or women’s conferences where the organizers have created an opportunity for people to act on the movement of the Holy Spirit to repentance and confession. Fr. Chris said it was said that Pope John Paul was the most frequent visitor to reconciliation. The more that the saints became holy, the more they recognize their need to confess their sins. Fr. Chris said Cardinal Dolan wanted to use the opportunity to get all the bishops of the US to think about this topic and how central it is to the New Evangelization. Without repentance, the New Evangelization is dead in the water. In my experience, cosnesfors work with whatever the perceived expectations of penitents are with regard to following the reformed ritual for the sacrament: in most cases, therefore, there is not a formal reading of the Word in the course of the ritual, because most penitents will launch with the formula they learned as children (or have been encouraged to adopt by bloggers as re-verts, shall we say) and head directly into listing sins. It’s been decades since I’ve seen a guide for the whole reformed ritual in a reconciliation room or confessional.It’s not what it could be. Then again, it’s still better than the inexcusable practice I long encountered in some climes of having priests attempt to limit your confession to one sin, or, even worse, the simple admission that you are a sinner, et cet. ; deeply inhospitable (we need not even address liciety) practices that make penitents feel like parasites on a priest’s much more valuable time, shall we say.